Tiny, beautiful Baker City has, like most rural Oregon towns, long struggled to create new business and jobs out of the ashes of its natural resources industry. The seat of a remote county with a population of only 16,000, Baker suffers from high unemployment but it does not suffer from a lack of trying. Richard Chaves was born in Baker (his grandparents immigrated to Durkee in 1912 after foregoing a trip on the Titanic) and he and his wife, Kathleen, are ardent supporters of their community. They co–own Chaves Consulting Inc. (CCI), which provides computing and hosting services for Oregon government agencies, and have made it their business to also try to create 100 family–wage jobs – with good benefits – in Baker. They decided that the support and help–desk side of their tech business could get them there and over the past several years they’ve snagged several big contracts that have grown their company to 18 employees. Now CCI and several partners plan to open in late July a new data hosting center in the historic Baker Tower that Richard Chaves hopes will finally bring the rest of those 100 jobs to town. "The Synergy Data Center and Services business is about a dream we all have of bringing a clean, green, job–producing industry into Baker County," he says. CCI and its partners, Arikkan Inc. of Salem, are investing $1 million in phase one of the data center, which includes installing 42 racks that each holding 36 servers. The center will be a data and software storage and services facility, but it will be the related help–desk services it can offer that Chaves says will create the jobs. "The data center itself doesn’t require a lot of people," says Chaves. "It will create a few positions. But the spin–off jobs is where the potential exists." One new help–desk project in the works could create in two to three years those 100 jobs. Chaves says that project, not yet finalized, involves working with a state agency to be the redundant site for its critical applications. Though Chaves "initially resisted" the data center idea but then "the pieces just fell into place." 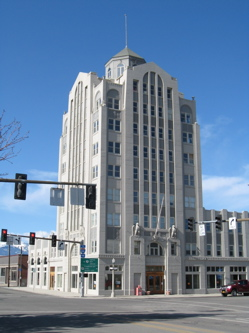 Those pieces included the renovated tower that made it an ideal spot for a data center; the 10–story building (left) is the tallest in Eastern Oregon, is highly secure, seismically sound and in a no–flood zone. Baker’s cool weather also helps cut energy costs by reducing the number of days when AC is needed; and labor costs are lower. Chaves says this all makes for highly competitive pricing for Synergy. Plus, Chaves says the local workforce is top–notch. "A lot of people here understand customer service," he says. "We never have trouble finding people to work in our help–desk jobs." Synergy’s partners want to make Eastern Oregon known for its high–tech industry. They plan to invest several million dollars over the next five years to build out 20,000 square feet of space in the data center. "This is an example of how a rural area can have a competitive edge because they are a rural area and are using the Internet," Chaves says. "That’s what’s exciting to me." It's a big dream, but big is not a stranger in tiny Baker.